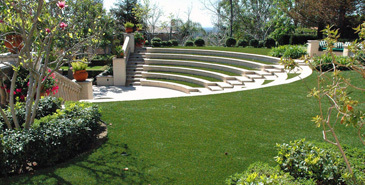 Five Star Turf installs highly durable, industrial-quality turf that’s designed to withstand heavy and repeated use. That’s because our synthetic grass products are engineered with dense fibers, advanced yarns, and a robust backing to meet the needs of a busy industrial setting. 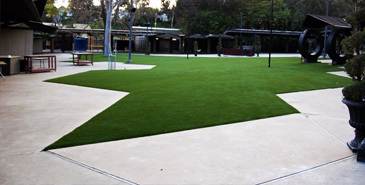 Best of all, our industrial strength synthetic grass still looks like real grass, and it’s soft to the touch. This ensures a forgiving landscape surface that isn’t susceptible to dead spots, flattening, holes, or muddy patches. Five Star Turf’s industrial turf is perfect in and around of factories, warehouses, plants, construction sites, and other areas where the work doesn’t stop. Artificial Grass by Five Star Turf continues to save companies plenty of time by cutting landscape maintenance by 75 percent or more. They also save plenty of water because unlike natural grass, they only require an occasional rinse from time to time which means reducing or even eliminating the need for a costly sprinkler system altogether. And best of all, you’ll save plenty of money along while preserving the environment by reducing carbon emissions from mowers and wasted water! Contact Five Star Turf to learn more about our industrial artificial turf applications. Our trained customer service professionals can help select the surface that’s right for your specific needs. We have a trained installation team at the ready to transform your landscape into an aesthetically pleasing and practical space.